It is always exciting to see a client’s wedding featured in a publication. Last week I saw just that. 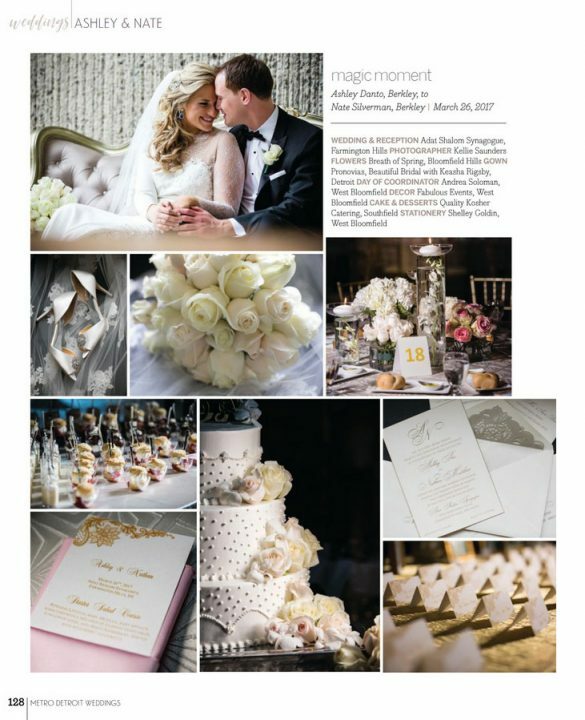 I saw Nate and Ashley Silverman’s wedding featured in the Metro Detroit Weddings magazine. Ashley had tagged us in the post on Facebook. Then, later in the day, Ashley’s Mom, Karen, came in to see me with a huge smile on her face. I knew exactly why she was so happy. She had the magazine in her hand and the page marked. We talked about the wedding and how it was nothing short of amazing. It is always special to hear from a client after the event. For our part of the event, we provided both LED uplighting as well as LED Pinspots to highlight the awesome florals on the tables. For the table linen, we used our Champagne Bentley and we topped it off with a Pink Matte Satin Napkins. We brought in our gold chiavari chairs to finish off the look. The ceremony and reception was held at Adat Shalom Synagogue in Farmington Hills, Michigan. Entertainment was provided by the Brian Alexander Band. They are nothing short of amazing. To top off an already great event, the food was prepared by Quality Kosher Catering. The event was put together with an incredible team of seasoned professionals. They are all here and I highly encourage you to visit them and use them for your upcoming wedding or special event. And of course, last but not least. Fabulous Events provided the rental of Table Linens, Napkins, Chiavari Chairs and LED Lighting throughout the room.